The Custom Design Inert turntable mat is available in acoustic aluminium (for suspended turntables) or stainless steel (for non suspended turntables) and is designed to dampen resonance vibrations for better sound. Isolation is all important, as is suspension and the mechanical design of your turntable. Unwanted energy generated by standard metal platters, or the turntable motor or even sound vibrations from loud speakers can create a "clouding" effecting your sound. 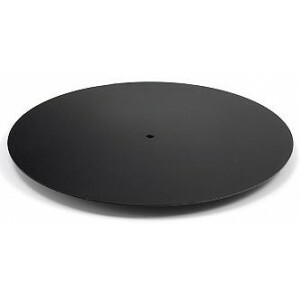 Many turntable platters are manufactured from Mazak which itsef resonates constantly. The constrained layer dampening system with a 3:1 ratio has proven to be the most efficient for resonance absorption. The sandwich design contains a patented polymer which converts energy uniquely for proven benefits to Hi-Fi enthusiasts. Dimensions: 296mm x 2mm (black only).